With more than 500 Canadian radio stations from coast to coast, Radioplayer Canada offers nearly every style of music, news, sports, talk and entertainment, in both official languages… anytime, anywhere. 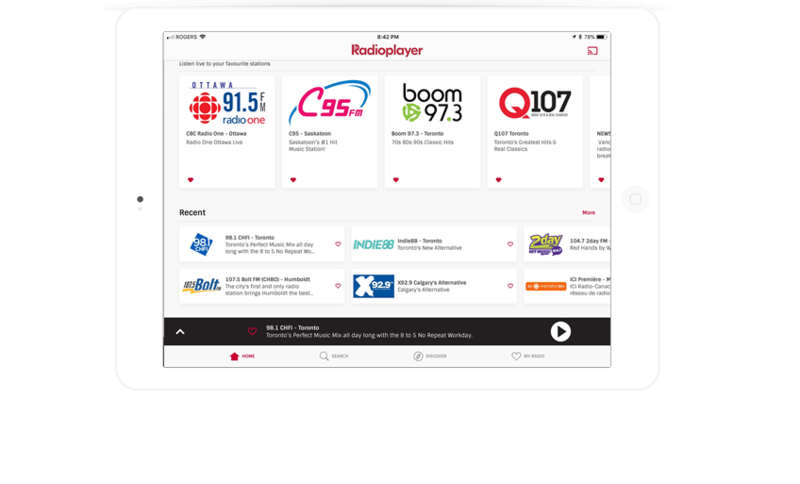 Radioplayer Canada is a free radio streaming app and an online audio player found on radio websites, delivering live and catch-up radio from hundreds of stations, coast to coast in Canada. Radioplayer allows you to discover your favorite radio through search and recommendations based on your listening history, geographical location, as well as crowd-sourced trending. Turn your smartphone or tablet into Canada’s most powerful radio right now by downloading the Radioplayer Canada app. Radioplayer Canada is a partnership between CBC and Radio-Canada, the stations of Bayshore Broadcasting, Blackburn Radio, Blackgold Radio, Byrnes Communications, CAB-K Broadcasting, Central Ontario Broadcasting, Clear Sky Radio, Cogeco Media, Corus Entertainment, Durham Radio, Fabmar Communications, Golden West Broadcasting, Harvard Broadcasting, Larche Communications, Newcap Radio, Jim Pattison Broadcast Group, Rogers Media, Rawlco Radio, RNC Media, Saskatoon Media Group, Vista Radio, and Westman Communications Group, as well as the National Campus and Community Radio Association (NCRA/ANREC), among others.